When you think of the walls of a beach cottage, you probably think of bright whites and pale, sun-washed blues. But what makes those walls come alive? Add a touch of whimsy to your space and a sense of a beach life well-lived with beach cottage art! A beach cottage, by definition, is a relaxed space—a place where nothing is too precious, or likely to be ruined by sandy feet or ocean-drenched pups. A beach cottage is a place where friends and family always feel right at home, and the art you hang on your walls should reflect this laid back attitude. 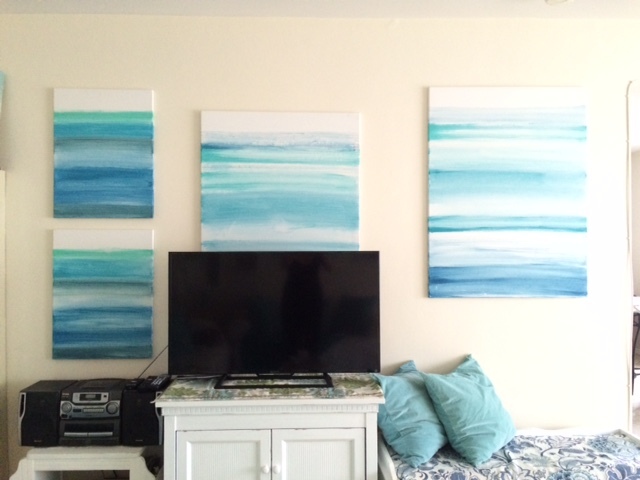 And, of course, beach cottage art should evoke the light and colors of the sea. 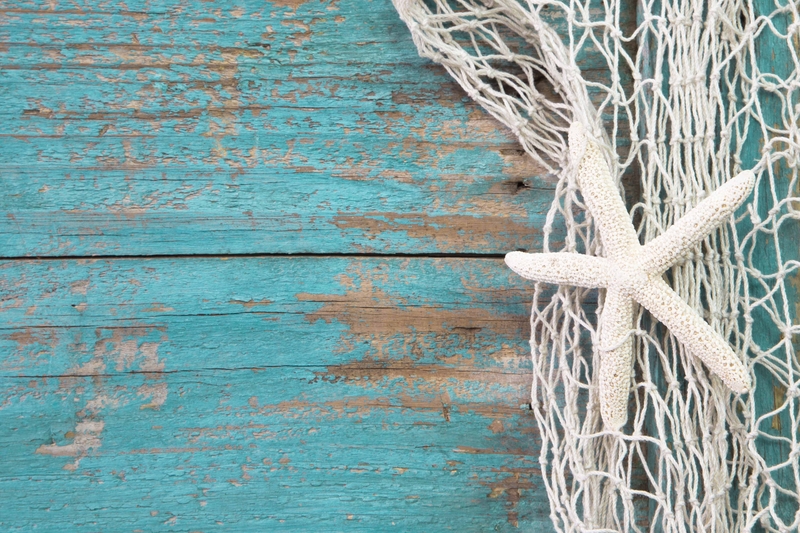 Creating or sourcing beach cottage art doesn’t require much money. A wall of mirrors and coastal art in weathered wood or whitewashed frames can be really easy and inexpensive to pull together. If you want to exercise your inner “Van Gogh,” you can also try your hand at sweeping some brushstrokes of ocean blues across a few white canvases you purchase from an art supply store like Aaron Brothers. 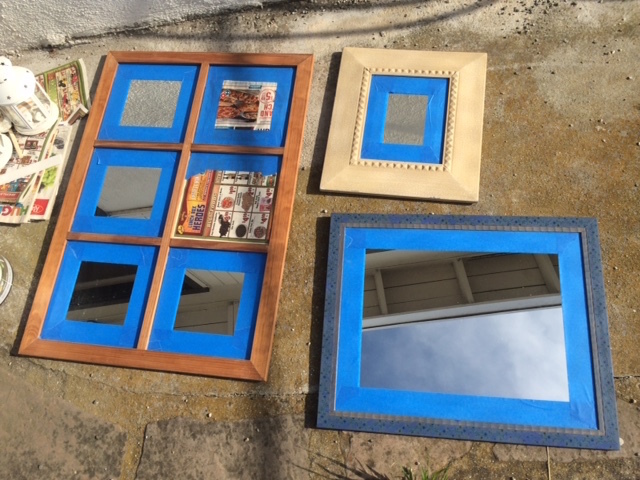 If you don’t have any old mirrors on hand that would lend themselves to repurposing for the coastal look you’re trying to create, hit a few yard sales over the weekend. Keep an eye out for older, vintage mirrors whose frames can be transformed with a couple of coats of white paint. Pale aqua, deep teal, and bright turquoise paint shades will also work well, adding pops of color to your wall. These colors, used sparingly, can be chosen to coordinate with other accessories, like throw blankets, toss pillows and candles. Pops of coral pinks, reds or oranges can also work well as a secondary accent color, if you use these shades on just a frame or two. 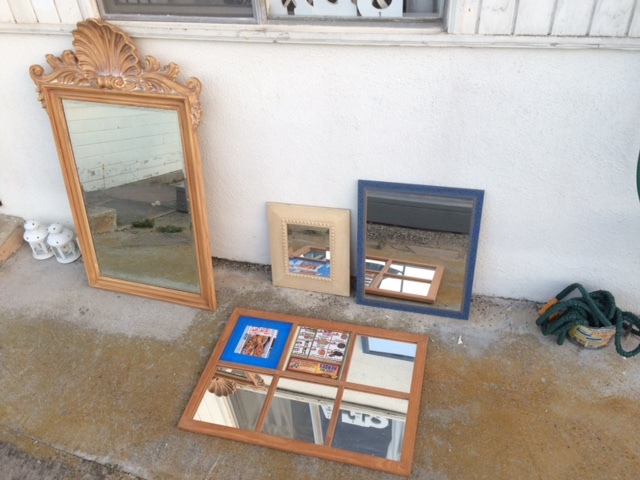 Local thrift stores can be great places to source mirrors and wall art for your beach cottage. You may even find some hand-painted seascapes in old frames that can be refreshed with a coat of paint. You might also hunt for a few empty frames in a range of shapes and sizes which, when repainted in white or varying shades of blue—or another color from your design palette—can make an appealing art installation when arranged together on a wall. If you’d like to craft some shadow boxes filled with art and seashells for a mixed media project, Ikea can be a good source for those. 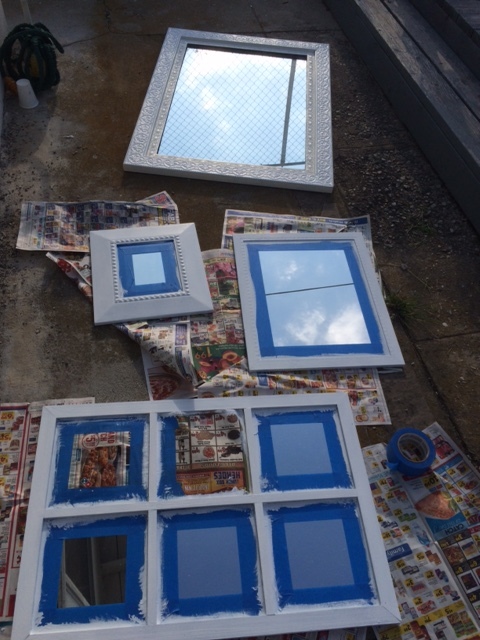 When repainting frames, you’ll need to assemble them in a well-ventilated area. Be sure to protect the mirrors and artwork. Lay your frames out on a tarp or some old newspaper, and use painter’s tape to mask off the glass or art so they don’t get splattered with paint. If you’re using spray paint, you’ll need to cover every surface that you don’t want to paint with plastic sheeting or newspaper. Once all the prep work is done, you’re ready to paint. I prefer to paint wood frames with a brush. For wood frames, a light sanding with medium-rough sandpaper will rough up the surface just enough for the paint to adhere to. This process is sometimes called “giving the surface some tooth” in do-it-yourself parlance. I use bright white paint for most of the frames I repaint for my beach cottage, but when I want to add sea-washed aquamarine, my two all-time favorite shades are “Lazy Days” and “Tranquility” by Valspar Signature paints from Lowes. 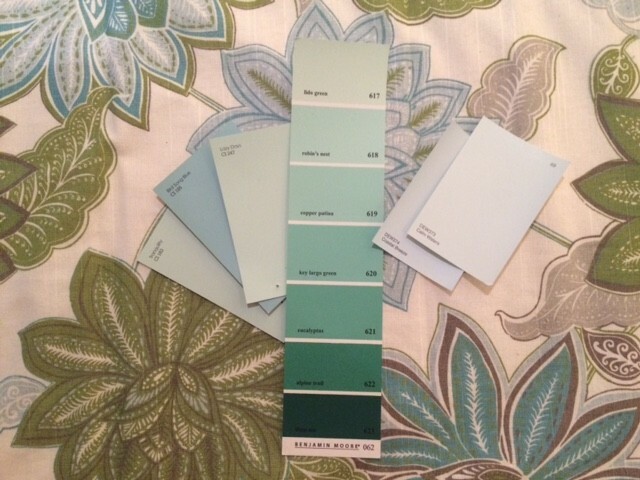 Valspar’s “Bird Song Blue” also blends beautifully with the other hues. Used together, they look like worn sea glass. 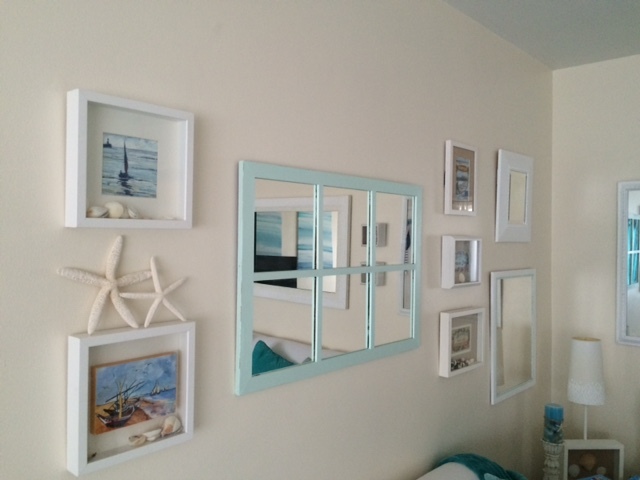 Beyond Super White, the Dunn Edwards colors “Calm Waters” or “Coastal Breeze” work well when repainting old frames for beach art, as do “Lazy Days” and “Tranquility” from Valspar, and “Robin’s Nest” from Benjamin Moore. You can give each frame two coats of paint for opaque coverage, or use just a single coat of paint if you’re after a worn and weathered look. After the paint has dried, you can rough up the edges and corners with some sandpaper. Use a light touch, and rough up the places where the frame might have gotten bumped or scraped over the years. This lends a “shabby beach” look to your art pieces. Once the paint is 80% dried, you can carefully remove your painter’s tape and other coverings. Allow the frames to dry for another six hours or so. 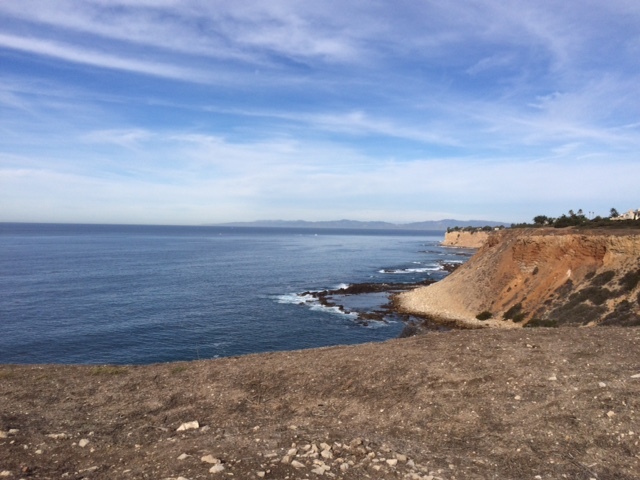 Weather permitting, this is the perfect time to take a break and go for a walk along the coast to breathe in some salt air and soak up the scenery that you’re working to replicate on the walls of your home. Every painter needs a hit of inspiration straight from the source! The next step involves configuring your painted frames and artwork into an arrangement by shape, size and color. I like to arrange my artwork on the floor first, moving pieces around until I arrive at a pattern that is balanced in color and scale. I also try to consider how the pieces will fit above my furniture arrangement. I try to line up larger, heavier frames centrally over a larger sofa, for example, and then arrange smaller frames around that. Once you arrive at an arrangement you like, you’re ready to “transfer” the frames in this same arrangement on your wall. You can begin the adventure of hanging your art! Starting with the largest piece first, use a pencil to lightly mark the wall with an “x” where your nail/s will go. I prefer to use just a single nail at the top center of each frame. This makes it easier to step back and straighten out any crooked frames as needed. For stability, I use more painter’s tape rolled up and affixed behind each corner of my frames. This helps protect the wall, keeps the frames from tilting askew, and holds them in place over time. When hanging frames in a salon style, you don’t need to worry about keeping an exact distance between each frame—just eyeball it. 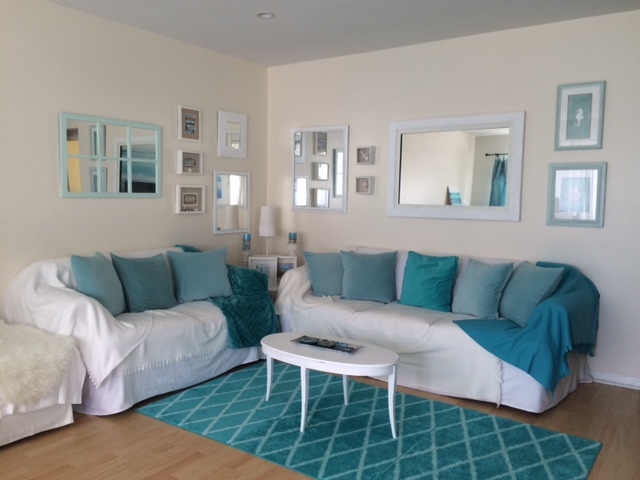 Remember, beach cottage style means things are relaxed, not perfect! 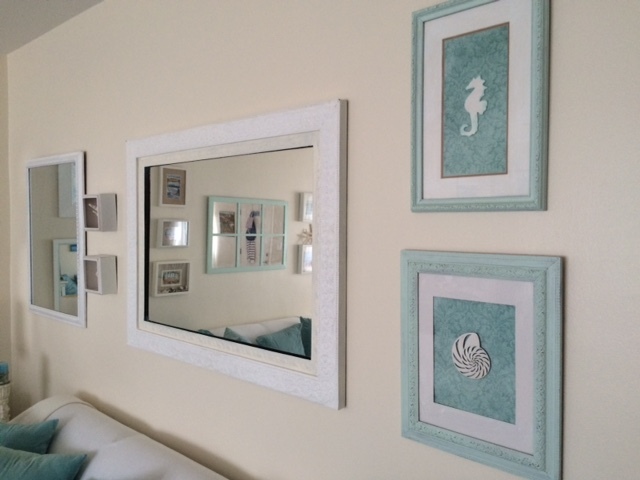 If you hang one frame a little too low (as I did), try propping a seashell or a starfish atop it to even things out. This can add a touch of fresh-from-the-beach charm, as well as a bit of texture. Above all, when hanging art in your beach cottage, loosen up and have fun with it. Best of all, if you manage to find some real bargains, you can easily decorate two to three walls of your beach cottage for under $100. A few weekends later you can sit back and enjoy your handiwork…and the compliments that roll in with your visitors!